If you’re a big fan of TV and film you’ll notice that the world of entertainment is being completely dominated by two distinct genres: nostalgia/reboots and big super powered franchises. We’ve seen nostalgia-heavy series like Full House and Gilmore Girls revived by Netflix, and now DC has joined the superheroic battle alongside Marvel and Star Wars. Some evil genius has combined these two trends by cutting a trailer for Star Wars: The Force Awakens to the music and tone of Full House. Check out the magic below. Just try to watch this "trailer" without cracking a smile. We dare you. What makes this video so funny is how light hearted it painted the latest Star Wars adventures to be. Billed as a space opera, things are generally rather grim in the franchise, including a handful of death and despair. Ignoring the tragedy that is Episode I: The Phantom Menace, the franchise has always contained a fair amount of darkness. Of course, if someone saw the above video without having seen any of Star Wars, they could be tricked into thinking it’s a full on space sitcom. The editor takes some of the lighter moments, or parts where characters from The Force Awakens happen to be smiling, and uses them to comedic perfection. From the very first shot, the video feels like an episode of Full House. Rather than the skyline of San Francisco, we are shown Finn, Han, And Rey entering Maz Kanata’s cantina in Takonada. As the trio looks up at the flags, they appear to be thoroughly excited about their upcoming hijinx. From there, things go full on Full House as each of the characters are introduced, including the name of the actor who portrays them. It starts of with a completely delighted Rey, before continuing to scroll through the rest of the cast. The final three introductions are definitely the most hilarious with Leia, Han, and Chewie. I can barely remember a moment in The Force Awakens where Leia wasn’t looking grim and serious, yet they found a great smiling shot of her that makes her seem as cheesy as Uncle Joey. Meanwhile, we’re given a shot of a happy-go-lucky Han in the Millennium Falcon and Chewbacca getting medical attention from that sassy medic. And topping of the cheese factor is one of the final shots, which is when Rey departs in the Millennium Falcon to find Luke at the film’s conclusion. Here, we have a big ensemble shot of the Rebellion seeing them off, including C-3PO waving to the ship. While this was already pretty campy in The Force Awakens, it gets amped up in this trailer, coming close to the ending picnic scene from the original Full House theme. 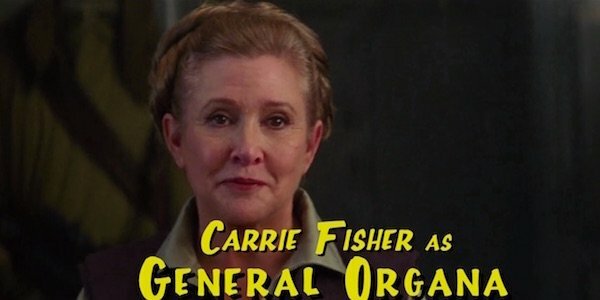 What did you think of this 90’s sitcom of The Force Awakens? Given that we can now own our own copy of the movie, we’re bound to see more hilarious videos like this in the near future. This isn’t even the funniest Star Wars viral. We found one that is MUCH funnier. This one, you have to see. Click on through, and get ready to laugh your midichlorians off. 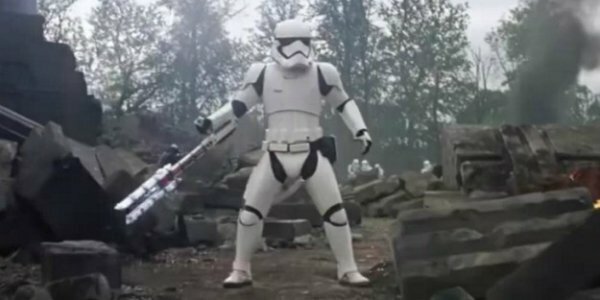 So, this is TR-8R. He’s the Stormtrooper who calls Finn (John Boyega) a "traitor" in Star Wars: The Force Awakens. He also has an awesome looking sword-weapon. Well, shortly after the film came out, the Internet did what the Internet always does. It had a field day making hilarious memes and viral videos based on TR-8R, or "Traitor," as they called him. They are HYSTERICAL. See the best ones right here. Not enough, believe it or not, TR-8R had some history and back story in the Star Wars universe. Read up on him here. In addition, there are FIVE huge Star Wars questions we had while watching the movie, and it turns out, most of them were answered off screen. See what we found out!